The 2018-2019 National Essay Contest winners have been selected! Click here to meet them and read their essay! 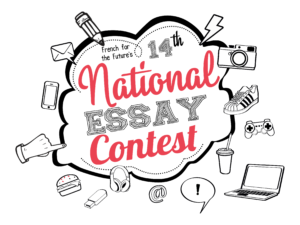 What is the National Essay Contest? Are you in Grade 10, 11 or 12 (secondaire IV or secondaire V in Quebec) and registered in a French program? Do you need a little boost to continue your education in French after high school? You’ll also have the chance to have your essay read by our celebrity judge! Magali Harvey’s rise to one of the world’s best women’s fifteens players began in high school, where she graduated from St. Patrick’s High School in Quebec City, Quebec. Having received her first cap with Canada’s Women’s Sevens Team in 2011, Harvey was later on the Canadian side that won a silver medal at the 2013 Women’s Rugby World Cup Sevens. She has also represented her country with the fifteens and was a big reason why Canada also finished second at the 2014 Women’s Rugby World Cup. 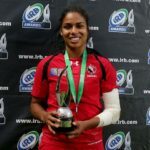 After her strong performance, in which she finished second in tournament scoring with 61 points and had a highlight reel 87-metre run for a try against France, Harvey was named the 2014 IRB Women’s Player of the Year. Magali is fully bilingual, and she is our Celebrity Judge for the 2018-2019 National Essay Contest. “When I was in high school, playing rugby would allow me to relax and to find my balance” says Magali Harvey, member of the Canadian Rugby Team. With unlimited means (time, money, resources…), how would you improve the well-being of high school students? Submit your essay between October and December by filling out our online form. We strongly encourage you to read the Rules and Regulations as well as the Evaluation Grid before you start writing your essay. Winners will be announced at the beginning of March following the Contest. If you teach French in Canada and you would like to be a part of our panel of judges for 2019-2020, please reach out to us by filling out this form.